On this Saturday (21st of July) we welcome our Dutch friends. Let’s prepare yourself with a production! 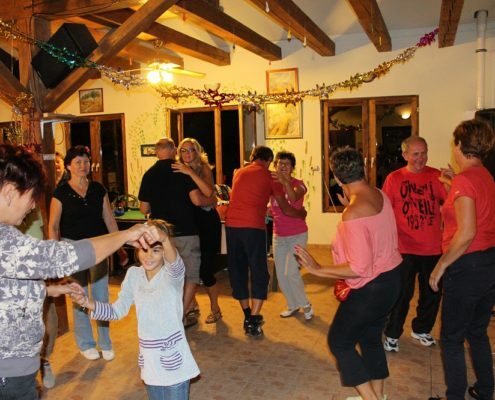 Several years ago we regularly organize a party to welcome our Dutch friends. At this year that will begin at 6 pm on Saturday. Anybody can join, the admission fee is a production. Our largest event, the 30th International Sportsweek will begin on Monday. We will start the competition at the 23rd of July. Apply here – online! You can choose which of these can you participate. Here is a schedule for the whole week. Altogether there will be more than 30 type of sports! http://natours.hu/wp-content/uploads/2017/07/SZN-logo.png 0 0 atmolt http://natours.hu/wp-content/uploads/2017/07/SZN-logo.png atmolt2018-07-18 01:51:162018-11-13 12:18:41Július 23 hétfő - július 29 vasárnap: Sporthét a Szikin - a harmincadik! Every year in May there is a „campsite-beautifying day”, when every guest is offered the possibility to remake the campsite in their own image. On such occasions our diligent guests plant flowers, prune trees, help to modernise our buildings. The opening of the season starts with a panel discussion held together with our guests. At this forum anyone can make suggestions concerning the forthcoming period of time. In case of high attendance there is a disco party at the end of the event. The last weekend of May belongs to the kids. They can test themselves in game quizes, pancake-eating- and refreshment-drinking contests, and they can also try out different handicrafts. In the middle of June lots of artists come to the campsite: painters, jewellery craftspeople, photographers. Our guests will be given the possibility to permanently observe them at work, and they can also buy the products. In June we organise a garden party as well. Groups of friends are expected to apply for the event. The jury awards the best meals cooked on the spot in different categories. On the Saturday prior to the Sports Week we come together to greet our Dutch friends. That evening children and adults are given the possibility to show their skills. Anyone can do a performance individually or in a group: singing, joke-telling, tale-telling, acrobatic stunts, legerdemain, performing short scenes. This is our most popular event. Given its international character, lots of foreign guests take part in it as well. During a whole week the competitors can measure their skills in a lot of individual and team sports in children and adult age groups. The announcement of results takes place on the last day of the week. Every year in August, on our guests’ initiative, we dedicate a Saturday to celebrate our favourite lake. It includes a Miss Lake beauty pageant, and the winner is carried around the beach and campsite by four men – who have deserved this privilege by winning the beer-drinking competition – on their shoulders. In the afternoon couples can also test themselves in different skill competitions. In the evening the polystyrene objects made during the day are set afloat. The day ends with a campfire, where everyone can fry their own steak. In August we organise a special evening event as well, when the beach guests are also allowed to stay after closing time to watch the sunset and the meteor shower with our guests. This is followed by a common barbecue party when night falls. In the end the campsite employees dazzle our guests with a firework display. At the end of the season we organise a forum again, where everyone can tell their opinion about the period of time spent there. The participants can ask questions and make suggestions related to the next season. On demand, just like at the opening weekend, we end the day with a disco party.